Home » Bankruptcy » Are Royalties Part of the Chapter 7 Estate? 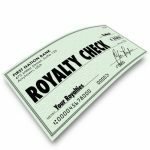 Are Royalties Part of the Chapter 7 Estate? You’ve just finished writing a hit 5-book series on the wild life of a secret agent. You market your books in various ways and receive ongoing royalties for this effort from your contract with several online book merchants. Then, due to unforeseeable circumstances, you have to file for bankruptcy. Are these royalties part of the bankruptcy estate? The books have all been written. But, the property (the books) will continue to generate income (the royalties) for the bankruptcy estate past the date of filing. Copyrights you own at the time you filed bankruptcy, or royalties you are entitled to receive, or other intellectual property generating income (or otherwise subject to liquidation for value) become part of your Chapter 7 bankruptcy estate. The bankruptcy trustee may receive any income received by any asset of the bankruptcy estate. Ordinarily, this decision by the trustee will involve weighing whether collecting these royalties and keeping the bankruptcy estate open is in the best interest to your creditors. If the revenue stream is irregular, small or infrequent, the trustee may abandon her interest and return the asset to you. In some cases the trustee may attempt to sell your right to receive royalties, or the copyright itself. If you have a bankruptcy case involving royalties, or seek further information regarding a Chapter 7 or Chapter 13 bankruptcy, please contact the lawyers at Winslow & McCurry, PLLC at (804) 423-1382.